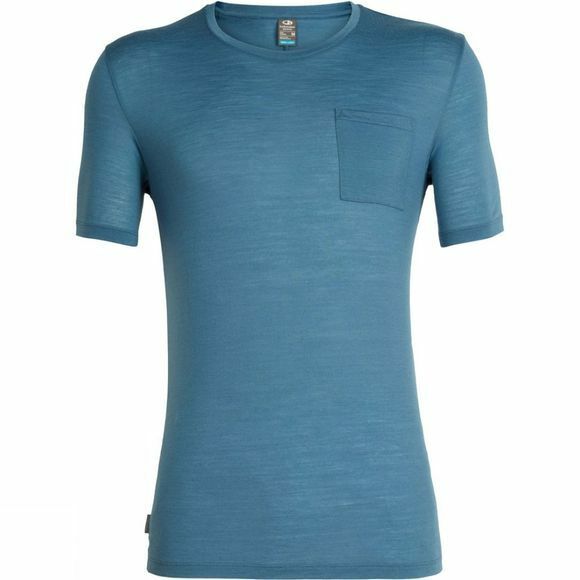 An all-year-rounder Men's Elements Short Sleeve Pocket Crewe T-Shirt from Icebreaker is a classic slim-fit T-shirt in a merino blend. The ultra-lightweight 130gm jersey fabric features Cool-Lite, which is a blend of merino and natural TENCEL for comfort in warm-to-hot conditions. The fibers are corespun around nylon for enhanced durability and next-to-skin softness. Designed to look and feel great, whether you're running for the train or on holiday, it's constructed with forward-set side seams, set-in sleeves for shaping around the shoulders and a center-back seam for a slimline fit. The longer length is practical for added coverage, the crewe neck offers versatility, and the front pocket completes this modern, versatile look. Nature created Icebreaker merino wool as protection against the scorching summers and freezing winters of New Zealand’s rugged Southern Alps mountain range. The merino is one of the world’s most ancient and toughest breeds of sheep. Icebreaker has pioneered the use of merino wool in the wilderness since 1994, and have now fused nature and technology to create merino layers for the outdoors, for performance sports, and for the city. Icebreaker merino garments are soft and non-itch, warm in the cold and cool in the heat, they breathe to prevent clamminess, and have a miraculous ability to warn off stinkiness.